Autumn is a great time to visit the Berkshires! There is still great theater at Berkshire Theater Festival, Shakespeare and Company, and the Great Barrington Stage Company. The beautiful foliage of fall continues to delight the senses, and the many great restaurants provide wonderful repasts as well as alternative evening entertainment. The gallery recently expanded both its space and the number of artists represented. Notably we have added the works of Jon Kuhn, Bertil Vallien, and Martin Blank to an already stellar list of artists. Many of our visitors are saying that the gallery has never looked better and that the selection of glass art is the best yet. We agree! We certainly hope that your fall plans include a visit to the Berkshires! Martin Blank is fast emerging as one of North America’s premiere figurative sculptors with a style quintessentially his own. Blank’s work is on display in galleries throughout the United States, and is featured in international exhibitions including the Millennium Museum in Beijing, China, the Shanghai Museum of Fine Art and the American Embassy in Slovakia. In 2001 he created the Bill and Melinda Gates Foundation "Access to Learning Award" for recipients in Finland, Argentina and Guatemala. Recently, Blank was among a group of America’s most renowned glass artists invited to make presentations to create public art for the new World Trade Center Building in New York City. "Amber Torso" by Martin Blank is an excellent example of the potential of using glass in the creation of figurative sculpture. Having seen hundreds of figures in bronze and stone, it is a rather unique delight to be able to look into and even through a glass figure. Blank’s use of color makes the aesthetic all the more pleasing to the eye..
With “Amber Torso”, Martin Blank has managed to capture the strength, dynamism, and grace of the human form and its potential for action while in repose. In this way, Martin’s remarkable glass sculpture is reminiscent of the figures associated with classical Greek and Roman art. 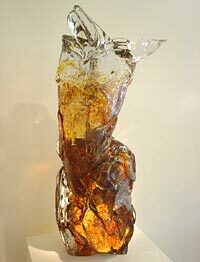 The Amber Torso is a fine example of the artistry and raw power of Martin Blank’s figure series. This piece has a scale that evokes Michelangelo’s “Slave” series. The work has the pensive “force within” nature. 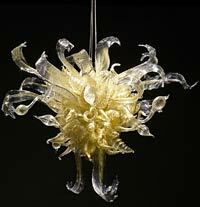 It is quite a technical feat to create such a work in blown glass. The Gallery will be open from 11am to 5pm, daily. Please contact the gallery by phone at 413.298.3044, or via email at [email protected] for further information. "Chihuly at Phipps: Gardens and Glass"
"Celebrating America’s Public Gardens: Green Today, Growing Tomorrows"
"A five story expansion at the Rhode Island School of Design’s Museum will open in September 2008 with a new exhibit by glass sculptor Dale Chihuly. The Chase Center will provide a 43,000 square foot expansion to the RISD Museum, one of the region’s premier art museums, and creates new exhibit space intended for blockbuster art displays. Chihuly has not told the Museum exactly what he plans, but is shipping, on four tractor trailors, 22,000 pieces of glass from the west coast, according to museum director Hope Alswang. "When asked what I wanted, I said I want it to be really, really, magical," she said. "And he laughed and said, ‘You know, everything I do is magical’". A complimentary exhibit will feature work by other glass artists who are alumni of the art and design school. An opening ceremony is scheduled for September 27, 2008. "An Art of Our Own: Women Ceramicists from the Permanent Collection"
"Viva Vetro! Glass Alive! Venice and America"
The first full-length book of Powell’s art, Stephen Rolfe Powell: Glassmaker includes 250 color photographs of Powell’s artwork that showcase the unique interplay of light and color in the transparent, opaque, and translucent glass he uses. Amidst vibrant photos of the final products, the book features images of the excitement and tension-ridden glassmaking process. Even with precision and care, only half of Powell’s pieces are a success, making each attempt a formidable and exhilarating journey. Essays by art critic James Yood, Milwaukee Art Museum curator Laurie Winters, and a host of other friends and colleagues supplement the photographs and provide textual insight into the inception and stature of Powell’s artistry and life. Powell has garnered substantial acclaim for his artwork. 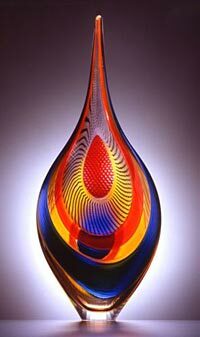 In addition to being selected as one of Kentucky’s top twenty artists of the twentieth century, he has demonstrated his glassblowing techniques at the Salt Lake City Olympics and was selected as one of eight American artists to display their work in the 1998 Venezia Aperto Vetro exhibit in Venice. Stephen Rolfe Powell: Glassmaker documents Powell’s work from the beginning to the present, leading readers on an polychromatic odyssey into Powell’s life and career. 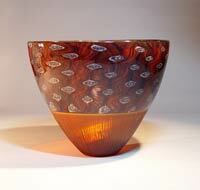 Stephen Rolfe Powell is a professor at Centre College in Danville, Kentucky, where he runs the glass program. 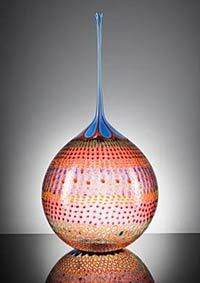 From February 22-September 2, 2008, the Museum of Glass in Tacoma will present "Lino Tagliapietra in Retrospect: A Modern Renaissance in Glass". This show traces thirty years in the career of Maestro Lino Tagliapietra. There has never been a retrospective look at Lino Tagliapietra’s art and career in its entirety. This exhibition will represent not only pivotal and renowned series of artistic work covering a period of approximately thirty years, but also designs made for industry and private objects that have never been exhibited. This exhibition and accompanying catalogue will document the unparalleled contributions of Lino Tagliapietra and the Seattle area to the history of the visual arts and glass, as both art and superlative craft. 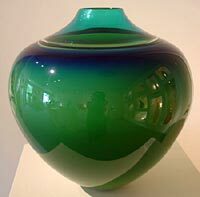 In addition, a DVD of Lino Tagliapietra demonstrating his signature glassmaking techniques using the facilities of the Museum of Glass in Tacoma is planned for production by the Museum. The American studio glass pioneer Steven Weinberg’s first solo exhibition in Asia, showcasing selected works of the past 30 years and from five collections throughout Weinberg’s thirty year career: his "Boat", "Icon", "Cube", "Mandala", and the newest "Life Studies" series. All works will be available for purchase. "Weinberg has held over 200 exhibitions all over the world. His work is represented internationally in the permanent collections of over thirty major museums, including the Metropolitan Museum of Art in New York, The Musee des Art Decoratif, Palais du Louvre in Paris, and The Victoria and Albert Museum in London. 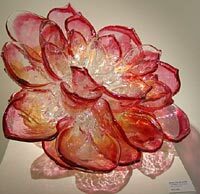 The artist has created some of the most precise and compelling cast glass sculptures on the contemporary art scene. 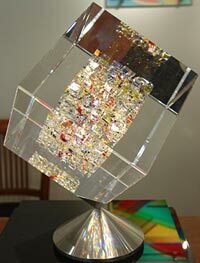 Lauded for his exceptional command of the rigorous and unforgiving medium of glass and crystal, his technical achievement offers the viewers interesting optical experiences which have been known to stump the mind. 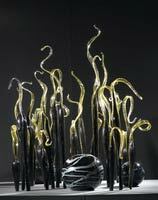 Weinberg has built successful practices in the use of cast glass, and has personally invented and designed techniques which are widely used today in studios and universities worldwide. This American artist has been participating in a full fledged Journey to China; with numerous trips to our Far East neighbor. 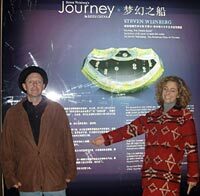 In both 1995 and 2001, Weinberg was invited by China’s famed glass art couple, Loretta Hui-Shan Yang and Chang Yi to take part of the International Contemporary Glass Exhibition in Taipei, Beijing, and Shanghai. Weinberg now finds himself creating works based off his travels throughout China; the first of which, his ‘Heaven and Earth’ series, each symbolizing a Buddhist Mandala with the Chinese symbol of earth precisely cut into its center. Weinberg’s Journey continues with the introduction of China’s first internationally acclaimed glass master Loretta Hui-Shan Yang onto New York’s contemporary art scene. Located in the metropolitan centre of Shanghai, neighboring the new development Xintiandi, Liuli China Museum is the first to open China to the world’s contemporary glass art. ‘Liuli,’ which twenty years ago was only an archaic word, has been brought back into modern day China to describe what we know as ‘ glass art’ by the aforementioned Chang and Yang. In order to protect the revival of ‘Liuli’ in China, the unwavering couple founded and built China’s only Liuli museum, solely dedicated to the worldwide exchange of glass art culture. Liuli China is the home of some of China’s oldest glass artifacts and a collection of contemporary glass works from the best artists of the United States, France, the United Kingdom, Sweden, the Czech Republic and China. Yang, Chang, and Weinberg, three worldwide pioneers of glass art, are long time friends who appreciate each other contribution to Liuli, Yang and Chang are honored to invite Weinberg to return to China for ‘Journey – The Dream Boat’."